Visitation entrance at Etowah County Detention Center, Gadsden, Ala. 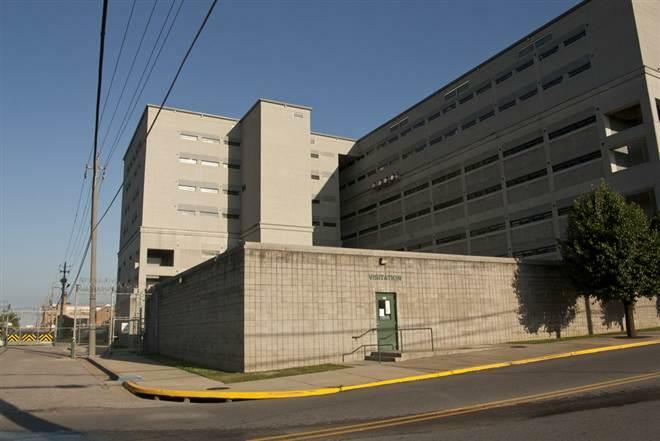 In many respects, Etowah County Detention Center in Gadsden, Alabama is just like any other county jail. But for 300 or so of the facility's occupants, it's a different story. They're not inmates, but immigrant detainees, and they're being held awaiting deportation. That arrangement prompted a legal complaint. The federal government pays Etowah County and communities across the country to keep immigrant detainees under lock and key in local jails. Critics complain these locations are isolated and detainees are kept thousands of miles from friends and family. That’s where Christina Mansfield comes in. She's the co-founder of CIVIC, short for Community Initiatives for Visiting Immigrants in Confinement. CIVIC founded a local group called the Etowah Visitation Project two years ago. Members of this group have been visiting the detainees ever since. That was Eunice Cho. She's a staff attorney with the Southern Poverty Law Center. Cho says CIVIC filed a legal complaint over what local volunteers saw during visits to the Etowah County Detention Center. Christina Mansfield was made aware of some of these conditions when she first visited the facility in late 2013. That assault is just one of the accusations in CIVIC’s formal complaint that it filed in mid-July. Other complaints include chronic understaffing, inadequate and barely edible food, and failure to respond to medical emergencies. The complaint demanded that the Etowah County Commission immediately terminate their contract with U.S. Immigration and Customs Enforcement. A written statement from ICE says the facility is routinely inspected, most recently in July 2014, and none of CIVIC’s claims could be substantiated. Eunice Cho says soon after the complaint was filed, members of the Etowah Visitation Project got some bad news. The Etowah County Sheriff’s Office issued a statement saying members of the project began violating rules of visitation, causing issues concerning the safety, security, and orderly operation of the facility. Christina Mansfield of CIVIC suspects there was another reason. The concert was organized by CIVIC and Adelante Alabama, a labor organization. The event drew dozens of activists, protesters and musicians, including one very special guest, according to Mansfield. Sylvester Owino spent years in the detention system including at Etowah. He spoke at the event. Immigration and Customs Enforcement stresses that the detainees still have visitation rights. The only thing that was terminated was the special privileges granted to the Etowah Visitation Project. But for the vast majority of detainees, that project was their only connection to the world outside Etowah’s walls. Eunice Cho has been studying other reports of abuse at immigration detention centers, and she’s found a trend. CIVIC, the Southern Poverty Law Center, the Etowah Visitation Project, and the detainees at Etowah County Detention Center are all hoping that trend continues.